750 ⊙/ / Europe - extensive inventory in three large stock books as well mounted on pages, with many older issues and various areas including Poland, Hungaria, Czechoslovakia, Romania and so on, partly close one above the other puted. Huge catalogue value! 888 /⊙/ Europe - extensive inventory in 10 large safe ring binder with numerous favorite areas. As well a nice part Iceland including older issues, as well mint never hinged miniature sheet, Ireland, Monaco, Netherlands, much Italy and so on. 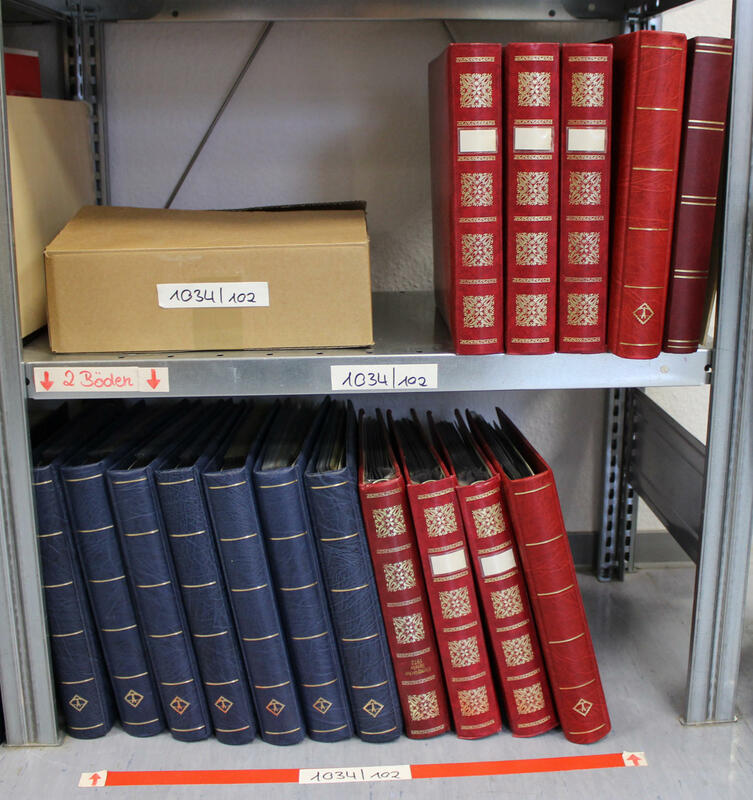 An extensive inventory with gigantic catalogue value, original price the albums already approximate 1000,- €. 1034 /⊙/ Europe / souvenir sheets - very extensive collection souvenir sheets of different areas in 15 ring binder, a stockbook and a box accommodated. As well an enormous amount of material with useful issues of different countries, also unperforated souvenir sheets, France PEXIP-souvenir sheet, an interesting part Romania with useful issues and many further areas. Very high catalog value! 1097 Europe - inventory from approximate 220 mint never hinged stamp booklet in the Lindner ring binder, as well France with red cross booklet, Great Britain, Portugal, Monaco and so on. High catalog value respectively very high subscription price! 1109 Literatur Europe - Michel, Europe catalogues, ribbon 1-7 complete from 2017 / 18. Original price 488,- €. 1188 ⊙/ Europe - old collection in the KABE-Album with many early issues as for instance Spain from the classic, overprints, airmail stamps, service edition, Yugoslavia, Czechoslovakia from HradÄ�any Castle and so on. 1194 /⊙/ Europe - collection in the spring back binder with issues from old to new of different areas, also classical period values, Old Italian states, Papal States with mint never hinged collection from the years 1959 / 84, Monaco, Triest, Serbia, Slovakia and so on. 1267 /⊙/ Europe - very nice and extensive collection in 11 Lighthouse-albums, all very fine mounted on pages with inscription. Included are very nice collections to the topic Europe union with many early issues, sets and souvenir sheets, better values and so on. As well for example various European congresses, Measure, sports events, European monument protection year with unperforated issues, Romania Exile government, famous European, artist and so on. Exceptional nice collection. Much material! 1438 ✉ Europe - interesting lot from covers and cards packed in a carton. Many attractive documents, numerous older examples, interesting frankings and so on. As well Serbia, Czechoslovakia, Turkey including beautiful registered cover from 1899 from Jerusalem to Erford, Baltic states with older documents, an extensive part Portugal and so on. Treasure trove! 1468 /⊙/ Europe - extensive lot in a large stockbook with numerous older issues, with also an interesting part Belgium, including souvenir sheets, Luxembourg, Russia with older values, with also shifted prints, Turkey, Papal States and so on. Very favorable! 1501 /⊙/ Europe - extensive inventory in eight stock books respectively ring binders accommodated with issues of different countries, as well older issues, numerous special- and commemorative values, souvenir sheets and so on, as well Bulgaria, Great Britain with older values, Portugal including mint never hinged issues, Netherlands, Lithuania, Russia / Soviet Union and so on. Enormous catalog value! 1555 ✉ Europe - very nice and extensive collection of 320 covers different of European countries in two thick ring binder made up, all with cancellations / Cachets from ships of different countries. Many decorative frankings and cancellations and so on. Including an abundant part Italy, France, as well also Scandinavia and so on. Magnificent object! 1573 /⊙ 327/41 Europe - extensive lot in two large stock books, as well lots of mint never hinged material, German Demokratic Republik (East Germany) heads set mint never hinged (Michel no. 327 / 41), Federal Republic of Germany with numerous mint never hinged and used issues including margin copies and corners of the sheet, many complete sets and so on. Favorable! 1686 Europe - nice mint never hinged collection from souvenir sheets from the seventies in two Lindner ring binder. As well numerous better issues like unperforated souvenir sheets from Romania including both cosmos souvenir sheets 1971, Hungaria Olympia-block 1972 cut, further better unperforated souvenir sheets and so on. Very high catalog value! 1687 Europe - nice mint never hinged lot of souvenir sheets in glassine-bags from the subscription supply with useful issues as for instance Hungaria souvenir sheet 99 B, as well further better issues from Bulgaria, Romania, Soviet Zone Goethe souvenir sheet 1949, Hungaria mona lisa miniature sheet 1974 unperforated and so on. Enormously acquisition price! 1835 x Europe - extensive inventory packed in a carton including lots of mint never hinged material, numerous special- and commemorative sets, souvenir sheets, beautiful subjects and so on. Including Albania, French and Hispanic Andorra, Bulgaria, a nice part Greece, Italy with numerous mint never hinged values and so on. Favorable treasure trove! 1836 Kart⊙n Europe - extensive inventory from mainly mint never hinged issues in glassine-bags packed in a carton, as well numerous special- and commemorative sets, multiples, souvenir sheets, nice motives and so on. With Papal States, Slovenia, San Marino, Gibraltar including miniature sheet and so on. Treasure trove! 1990 ⊙ Europe - nice and extensive lot of miniature sheet of different countries in the sheets album accommodated. Many lovely motives, popular issues and popular areas including Switzerland, Russia extensively present and so on. Enormously acquisition price! 1991 ⊙/ Europe - very nice and extensive lot of souvenir sheets and miniature sheet from the subscription supply in the ring binder accommodated with lots of material, favorite areas, lovely subjects and so on. As well a nice part Slovakia, Czech Republic, Albania and so on. To to the year 1999. Much material and enormously acquisition price! 2031 Europe - extensive mint never hinged collection from souvenir sheets and miniature sheet, as well various special prints in five Lindner T hingeless printed form ring binder formed. As well better issues, many various areas, unperforated issues and so on. Huge purchase price, very favorable!